Smallpox virion. Courtesy of US Centers for Disease Control and Prevention. Adult with variola major with hundreds of pustular lesions centrifugally distributed. Photo from Fitzsimmons Army Medical Center slide file. The earliest evidence of smallpox comes from ancient Egypt circa 1157 BCE, where the mummified remains of a pockmarked Ramses V were uncovered. International traders spread smallpox throughout the Old World during the 4th-15th centuries CE, while European explorers and conquerors brought the disease to the Western Hemisphere in the early 16th century. 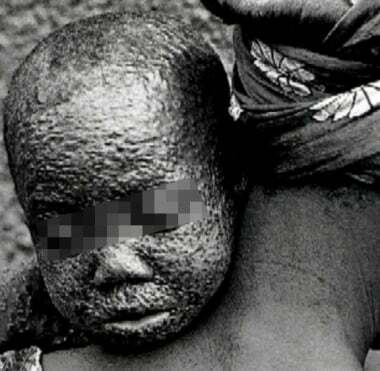 Smallpox directly and profoundly influenced the course of human history. Its tremendous morbidity and mortality led to indiscriminate killing of kings and warlords and tipped the balance of power with regularity in Europe and elsewhere. As a result of smallpox infection, whole civilizations, including the Incas and the Aztecs, were destroyed in a single generation, and efforts to ward off the disease indelibly affected the practice of religion and medicine. The variola virus is a large, brick-shaped, double-stranded DNA virus that serologically cross-reacts with other members of the poxvirus family, including ectromelia, cowpox, monkeypox, vaccinia, and camelpox. Unlike other DNA viruses, the variola virus multiplies in the cytoplasm of parasitized host cells. The 2 predominant variants of variola, major and minor, differ greatly in their mortality rates (30% vs 1%, respectively). Variola major was the predominant endemic strain throughout the world, and by the end of the 18th century, it was responsible for approximately 400,000 deaths a year in Europe. In patients who recovered from the disease, blindness was common, and disfiguring scars were nearly universal. 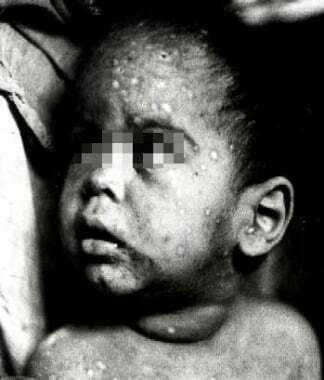 During the first half of the 20th century, all outbreaks of smallpox in Asia and most in Africa were due to variola major. Variola minor was endemic in some countries in Europe, North America, South America, and many parts of Africa. Variola minor is less common and much less virulent; it was previously found mainly in South Africa, South America, Europe, and Australia. The pharyngeal and influenzalike forms are relatively mild, usually affect individuals who have been previously immunized, and do not cause mortality. Cellular immunity and humoral immunity are elicited in response to variola infection. Neutralizing antibodies can be detected during the first week of clinical illness, whereas hemagglutination-inhibition and complement-fixation antibodies are found in the second to third weeks. Neutralizing antibodies persist for many years or decades after infection, whereas levels of hemagglutination-inhibition and complement-fixation antibodies generally decrease within a year. Cell-mediated immunity likely plays an important role in controlling disease; virus-specific cytotoxic T cells are detectable in lymphoid organs as early as 4 days after infection. These cytotoxic T cells are believed to limit viral spread by causing lysis of infected cells in the reticuloendothelial system and the skin. The relative importance of the cellular immune response against smallpox has been demonstrated in animals. Studies show that mice with defective T cells are able to generate normal humoral responses to a viral challenge, yet they die when exposed to Orthopoxvirus concentrations that are sublethal in healthy mice. Studies in rodents and sheep have demonstrated memory in the form of virus-specific, cytotoxic lymphocyte immune responses that occur long after the initial variola infection. Other studies developed a method of reliably classifying species of variola virus into major and minor species by genotype using novel real-time polymerase chain reaction (PCR) assay probes. Further investigation into genetic variations between species of variola virus may reveal variable response to therapeutic targets. Intentional inoculation with subvirulent strains of variola to protect against variola major (variolation) began in India sometime before the first millennium CE. This practice spread throughout the Old World and eventually reached Europe in the early 18th century. Although variolation was capable of inducing lifelong immunity in vaccinated individuals, the practice was a risky procedure, and those inoculated had a mortality rate of approximately one tenth that of individuals with naturally occurring disease. Furthermore, treated individuals were capable of transmitting disease to untreated individuals for some time after variolation. In one of the major accomplishments in modern medicine, Edward Jenner demonstrated in 1796 that an individual could be protected against disease. The skin could be inoculated with pustular material containing the cowpox virus, an orthopoxvirus closely related to variola. Although the heterologous immunity induced by vaccination (from the Latin word vacca, meaning cow) was not lifelong, this approach was significantly safer than variolation, and vaccination quickly spread throughout the world. 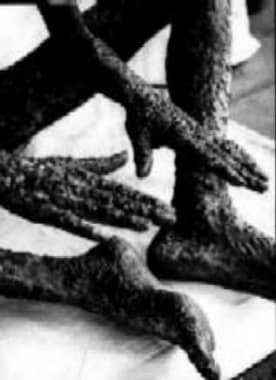 In subsequent decades, the strain of virus used was sustained by means of arm-to-arm inoculation or maintained as dried material on threads. Over time, the virus mysteriously changed from its original cowpox form to the strain of vaccinia used in current vaccines. In the latter half of the 19th century, the practice of growing virus for vaccines on the flank of calves was adopted to lessen the risk of transmitting other human diseases (eg, syphilis) during vaccination. The last case of endemic smallpox occurred in Somalia in 1977, and the last recorded case in humans occurred in England in 1978; this final case resulted from an accidental laboratory infection. In 1980, the World Health Organization (WHO) officially declared that smallpox had been eradicated. Currently, the only remaining known variola virus isolates are frozen in closely guarded repositories at the US Centers for Disease Control and Prevention (CDC) in the United States and at the VECTOR Institute in Russia. Bioterrorist Agents. Signs and symptoms. Chart courtesy of North Carolina Statewide Program for Infection Control and Epidemiology (SPICE), copyright University of North Carolina at Chapel Hill, www.unc.edu/depts/spice/bioterrorism.html. For patient education information, see Smallpox. 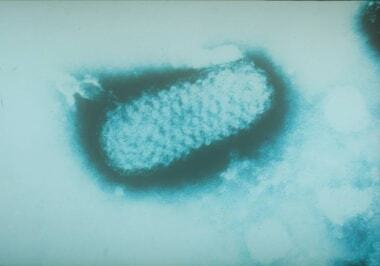 Smallpox has a lower transmission rate than measles, pertussis, and influenza. Transmission through casual and limited contact has been reported in military personnel. Although rare, airborne (ie, suspended viral particles) and fomite transmission can occur. Humans are the only natural hosts of variola; nonhuman animals and insects do not carry the variola virus. Pregnant women with smallpox tend to develop hemorrhagic disease; intrauterine infection occurs in even the mildest maternal infections, resulting in premature delivery and high fetal and neonatal mortality rates. Implantation of just a few virions of smallpox into the oropharynx or respiratory tracts can cause infection. The virus infects macrophages during the first 72 hours of the incubation phase. The virus migrates and multiplies in the regional lymph nodes, resulting in asymptomatic viremia by the fourth day. The virus multiplies in the spleen, bone marrow, and lymph nodes, resulting in a symptomatic secondary viremia (ie, fever, toxemia) by the eighth day. 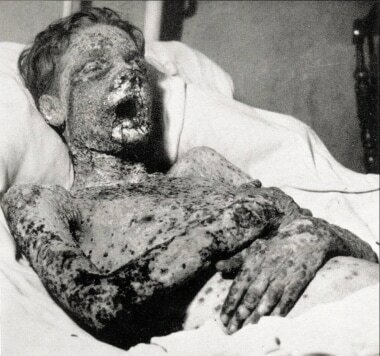 This patient with smallpox survived toxemia to succumb to secondary tissue damage days after this photo was taken. Courtesy of the US Centers for Disease Control and Prevention. The spleen, lymph nodes, kidneys, liver, bone marrow, and other viscera may also contain large amounts of smallpox virus. Incubation periods are typically 10-12 days but can range from 7-17 days. Intrauterine infections rarely occur and usually have shorter incubation periods. Patients exposed to smallpox through routes other than the person-to-person respiratory route also have shorter incubation periods. Prior immunization, vaccinia immunoglobulin (VIG), and, possibly, antiviral chemotherapy may extend the incubation period. Patients with smallpox are sometimes contagious upon the onset of fever (prodromal phase) but are most contagious upon rash onset. Infected persons are contagious until the last smallpox scab separates. The highest intensity of viral shedding is during the first 10 days of the rash. Infection rates among close contacts of infected persons have been reported to be between 37% and 88%. Survivors of natural smallpox infection acquire lifelong immunity. The last outbreak of smallpox in the United States was in 1947, when 12 cases were reported in New York City. In the United States, routine vaccination of the civilian population ended in 1972, and in 1990 it ended for the US military. The most current statistics indicate that approximately 41% of the resident US population is younger than age 30 years, and that most of this group has not been vaccinated against smallpox. The immune status of those who were vaccinated 30 or more years ago has not been satisfactorily established, but some evidence shows residual immunity. Reports from the late 19th century indicate that smallpox vaccination 20-30 years previously may not protect against infection but often prevents death. No conclusive studies have shown whether people with residual immunity can transmit smallpox to nonvaccinated individuals. Since 1978, no cases of smallpox have been reported in the world. The last endemic case of variola major was reported in Bangladesh in 1975; the last endemic case of variola minor was reported in Somalia in 1977. In 1978, a laboratory accident in Birmingham, England, resulted in a single case of the disease. Smallpox is authorized to be kept for research purposes only at 2 WHO reference laboratories. One is the CDC, in Atlanta, Ga, and the other is the State Research Centre of Virology and Biotechnology, also known as the VECTOR Institute, in Koltsovo, Russia. Routine smallpox vaccinations were stopped in 1972 and smallpox was declared eradicated in 1980 after a worldwide vaccination program. In 2002, The Washington Post reported that the Central Intelligence Agency (CIA) identified possible clandestine smallpox virus stocks in 4 other nations. The age distribution of smallpox mirrors that of the general population, although residual immunity from previous vaccination could potentially decrease disease in the older population. Historically, young or old individuals are more susceptible to severe smallpox. The mortality rate in patients with untreated smallpox is 30% or higher. The more severe hemorrhagic and malignant forms of smallpox are usually fatal. Morbidity is commonly associated with smallpox. Most patients (65-80%) recovering from infection have cutaneous scarring, which is made worse if secondary bacterial infections develop during the course of smallpox. Other complications of smallpox included dehydration and orchitis. Encephalitis occurs in 1 in 500 cases. Overwhelming toxemia has been the usual cause of death in smallpox. Variola major infection carries an overall fatality rate of approximately 30% (range, 15-50%) in an unvaccinated population and 3% in a vaccinated population. However, flat smallpox carries a 45.4% mortality rate in patients with discrete lesions who have been immunized. Unimmunized patients with confluent disease have a 99.3% mortality rate. Patients with hemorrhagic smallpox have a mortality rate of more than 96%, regardless of immunization status. Variola minor infection is a less common type of smallpox and a much less severe disease, with a death rate of 1% or less. Congenital smallpox infection results in a stillbirth rate of 35%; 50% of neonates die within their first few days of life. Duraffour S, Meyer H, Andrei G, Snoeck R. Camelpox virus. Antiviral Res. 2011 Nov. 92(2):167-86. [Medline]. Bera BC, Shanmugasundaram K, Barua S, et al. Zoonotic cases of camelpox infection in India. Vet Microbiol. 2011 Aug 26. 152(1-2):29-38. [Medline]. Carroll DS, Emerson GL, Li Y, et al. Chasing Jenner's vaccine: revisiting cowpox virus classification. PLoS One. 2011. 6(8):e23086. [Medline]. [Full Text]. Wahl-Jensen V, Cann JA, Rubins KH, et al. Progression of pathogenic events in cynomolgus macaques infected with variola virus. PLoS One. 2011. 6(10):e24832. [Medline]. [Full Text]. Medaglia ML, Pereira Ade C, Freitas TR, Damaso CR. Swinepox virus outbreak, Brazil, 2011. Emerg Infect Dis. 2011 Oct. 17(10):1976-8. [Medline]. Mohamed MR, Rahman MM, Lanchbury JS, et al. Proteomic screening of variola virus reveals a unique NF-kappaB inhibitor that is highly conserved among pathogenic orthopoxviruses. Proc Natl Acad Sci U S A. 2009 Jun 2. 106(22):9045-50. [Medline]. [Full Text]. Altmann SE, Jones JC, Schultz-Cherry S, Brandt CR. Inhibition of Vaccinia virus entry by a broad spectrum antiviral peptide. Virology. 2009 Jun 5. 388(2):248-59. [Medline]. [Full Text]. Loveless BM, Mucker EM, Hartmann C, Craw PD, Huggins J, Kulesh DA. Differentiation of Variola major and Variola minor variants by MGB-Eclipse probe melt curves and genotyping analysis. Mol Cell Probes. 2009 Jun-Aug. 23(3-4):166-70. [Medline]. Singh RK, Balamurugan V, Bhanuprakash V, Venkatesan G, Hosamani M. Emergence and reemergence of vaccinia-like viruses: global scenario and perspectives. Indian J Virol. 2012 Jun. 23(1):1-11. [Medline]. [Full Text]. Frey SE, Winokur PL, Salata RA, El-Kamary SS, Turley CB, Walter EB Jr, et al. Safety and immunogenicity of IMVAMUNE® smallpox vaccine using different strategies for a post event scenario. Vaccine. 2013 Jun 24. 31(29):3025-33. [Medline]. [Full Text]. Milton DK. What was the primary mode of smallpox transmission? Implications for biodefense. Front Cell Infect Microbiol. 2012. 2:150. [Medline]. [Full Text]. Breman JG, Henderson DA. Diagnosis and management of smallpox. N Engl J Med. 2002 Apr 25. 346 (17):1300-8. [Medline]. Espy MJ, Cockerill III FR, Meyer RF, et al. Detection of smallpox virus DNA by LightCycler PCR. J Clin Microbiol. 2002 Jun. 40(6):1985-8. [Medline]. [Full Text]. Ropp SL, Jin Q, Knight JC, Massung RF, Esposito JJ. PCR strategy for identification and differentiation of small pox and other orthopoxviruses. J Clin Microbiol. 1995 Aug. 33(8):2069-76. [Medline]. [Full Text]. Peterson BW, Damon IK. Orthopoxviruses: vaccinia (smallpox vaccine), variola (smallpox), monkeypox, and cowpox. Bennett JE, Dolin R, Blaser MJ, eds. Mandell, Douglas, and Bennett’s principles and practice of infectious diseases. 8th ed. Philadelphia: Elsevier; 2014. Bray M, Martinez M, Smee DF, Kefauver D, Thompson E, Huggins JW. Cidofovir protects mice against lethal aerosol or intranasal cowpox virus challenge. J Infect Dis. 2000 Jan. 181(1):10-9. [Medline]. De Clercq E. Cidofovir in the treatment of poxvirus infections. Antiviral Res. 2002 Jul. 55(1):1-13. [Medline]. Smee DF, Bailey KW, Sidwell RW. Treatment of lethal vaccinia virus respiratory infections in mice with cidofovir. Antivir Chem Chemother. 2001 Jan. 12(1):71-6. [Medline]. Smee DF, Bailey KW, Wong MH, Sidwell RW. Effects of cidofovir on the pathogenesis of a lethal vaccinia virus respiratory infection in mice. Antiviral Res. 2001 Oct. 52(1):55-62. [Medline]. Wells TS, LeardMann CA, Smith TC, Smith B, Jacobson IG, Reed RJ, et al. Self-reported adverse health events following smallpox vaccination in a large prospective study of US military service members. Hum Vaccin. 2008 Mar-Apr. 4(2):127-33. [Medline]. Neff J, Modlin J, Birkhead GS, et al. Monitoring the safety of a smallpox vaccination program in the United States: report of the joint Smallpox Vaccine Safety Working Group of the advisory committee on immunization practices and the Armed Forces Epidemiological Board. Clin Infect Dis. 2008 Mar 15. 46 Suppl 3:S258-70. [Medline]. Talbot TR, Stapleton JT, Brady RC, et al. Vaccination success rate and reaction profile with diluted and undiluted smallpox vaccine: a randomized controlled trial. JAMA. 2004 Sep 8. 292(10):1205-12. [Medline]. Kennedy JS, Frey SE, Yan L, et al. Induction of human T cell-mediated immune responses after primary and secondary smallpox vaccination. J Infect Dis. 2004 Oct 1. 190(7):1286-94. [Medline]. Baggs J, Chen RT, Damon IK, et al. Safety profile of smallpox vaccine: insights from the laboratory worker smallpox vaccination program. Clin Infect Dis. 2005 Apr 15. 40(8):1133-40. [Medline]. Ryan MA, Seward JF. Pregnancy, birth, and infant health outcomes from the National Smallpox Vaccine in Pregnancy Registry, 2003-2006. Clin Infect Dis. 2008 Mar 15. 46 Suppl 3:S221-6. [Medline]. Shchelkunov SN. An increasing danger of zoonotic orthopoxvirus infections. PLoS Pathog. 2013 Dec. 9(12):e1003756. [Medline]. Quenelle DC, Kern ER. Treatment of Vaccinia and Cowpox Virus Infections in Mice with CMX001 and ST-246. Viruses. 2010 Dec. 2(12):2681-95. [Medline]. [Full Text]. Simmons BJ, Falto-Aizpurua LA, Griffith RD, Nouri K. Smallpox: 12 000 years from plagues to eradication: a dermatologic ailment shaping the face of society. JAMA Dermatol. 2015 May 1. 151 (5):521. [Medline]. Greenberg RN, Kennedy JS. ACAM2000: a newly licensed cell culture-based live vaccinia smallpox vaccine. Expert Opin Investig Drugs. 2008 Apr. 17(4):555-64. [Medline]. Monath TP, Caldwell JR, Mundt W, et al. ACAM2000 clonal Vero cell culture vaccinia virus (New York City Board of Health strain)--a second-generation smallpox vaccine for biological defense. Int J Infect Dis. 2004 Oct. 8 Suppl 2:S31-44. [Medline]. Smee DF. Orthopoxvirus inhibitors that are active in animal models: an update from 2008 to 2012. Future Virol. 2013 Sep. 8 (9):891-901. [Medline]. Nalca A, Zumbrun EE. ACAM2000: the new smallpox vaccine for United States Strategic National Stockpile. Drug Des Devel Ther. 2010 May 25. 4:71-9. [Medline]. Kennedy JS, Gurwith M, Dekker CL, Frey SE, Edwards KM, Kenner J, et al. Safety and immunogenicity of LC16m8, an attenuated smallpox vaccine in vaccinia-naive adults. J Infect Dis. 2011 Nov. 204 (9):1395-402. [Medline]. Chittick G, Morrison M, Brundage T, Nichols WG. Short-term clinical safety profile of brincidofovir: A favorable benefit-risk proposition in the treatment of smallpox. Antiviral Res. 2017 Jul. 143:269-277. [Medline]. Frey SE, Winokur PL, Salata RA, El-Kamary SS, Turley CB, Walter EB Jr, et al. Safety and immunogenicity of IMVAMUNE® smallpox vaccine using different strategies for a post event scenario. Vaccine. 2013 Jun 24. 31 (29):3025-33. [Medline]. LeDuc JW, Damon I, Relman DA, Huggins J, Jahrling PB. Smallpox research activities: U.S. interagency collaboration, 2001. Emerg Infect Dis. 2002 Jul. 8 (7):743-5. [Medline]. Greenberg RN, Hurley MY, Dinh DV, Mraz S, Vera JG, von Bredow D, et al. Correction: A Multicenter, Open-Label, Controlled Phase II Study to Evaluate Safety and Immunogenicity of MVA Smallpox Vaccine (IMVAMUNE) in 18-40 Year Old Subjects with Diagnosed Atopic Dermatitis. PLoS One. 2015. 10 (11):e0142802. [Medline]. Tasker SA, Schnepf GA, Lim M, Caraviello HE, Armstrong A, Bavaro M, et al. Unintended smallpox vaccination of HIV-1-infected individuals in the United States military. Clin Infect Dis. 2004 May 1. 38 (9):1320-2. [Medline]. Boylston AW. The Myth of the Milkmaid. N Engl J Med. 2018 Feb 1. 378 (5):414-415. [Medline]. Lloyd J, Cheyne J. The origins of the vaccine cold chain and a glimpse of the future. Vaccine. 2017 Apr 19. 35 (17):2115-2120. [Medline]. After exposure to the smallpox virus, a symptom-free incubation period follows. It normally lasts 10-12 days but may vary from 7-17 days. Smallpox begins with fever, headache, and severe backache. A rash appears after 2-4 days and progresses through characteristic stages of papules, vesicles, pustules, and, finally, scabs. The scabs desquamate at the end of the third or fourth week. Courtesy of the World Health Organization. Smallpox rash at days 3, 5, and 7 of evolution. Lesions are denser on the face and extremities than on the trunk. They also appear on the palms of the hand and have a similar appearance. Courtesy of the World Health Organization. Flat-type smallpox on day 6 of the rash. Courtesy of the US Centers for Disease Control and Prevention. Smallpox vaccination with bifurcated needle. Reconstituted vaccine is held between the prongs of the needle and injected subcutaneously by multiple punctures; 15 rapid strokes, at right angles to the skin over the deltoid muscle, are made within a 5-mm area. Courtesy of the World Health Organization. Smallpox vaccination. Evolving primary vaccination appearance. Courtesy of the US Centers for Disease Control and Prevention. Typical temperature chart of a patient with smallpox infection (from Henderson, 1999).